Visiting the remote Crisp Point Lighthouse in Michigan's Upper Peninsula long had a place on my bucket list. I remembered hearing about an incident where two women decided to visit the place during a snowy April and became stranded along to road out to it, living for two weeks on Girl Scout cookies, cheese puffs and snow melt until someone finally found them! Yup. Definitely sounded like our type of place! Driving out to Crisp Point on a sunny summer day was definitely a far safer time to try the trip, and while the place was beautiful enough to allow me to capture the image that won me an "end-of-year" award from my local camera club, there is good reason that the lighthouse is pretty much only open seasonally! The lighthouse's seasonal closing came about two weeks on October 29 as I searched through my images and memories to produce this story and remind myself again why we love visiting Michigan's Upper Peninsula. The lighthouse sits on a stretch of Lake Superior beach that gained a reputation as part of the "Shipwreck Coast" during the early 1800s. Remember folksinger Gordon Lightfoot's sad song relating the story of the sinking of the Edmund Fitzgerald in 1975 in a particularly remote area? Well, that maritime tragedy took place just 17 miles northeast of Crisp Point! Crisp Point is also 37 miles north of Newberry, 14.5 miles west of Whitefish Point or 26 miles from Tahquamenon Falls State Park. It takes about 45 minutes to drive from the falls to Crisp Point on a sunny summer day. The drive turns off of highway M-123 at CR 500 before veering right and going 11.6 miles on Luce County Road 412 before another 6.5-mile ride through the Lake Superior State Forest that ends at the lighthouse. The lighthouse grounds are always open, but the county does not plow CR412 during the winter months. The visitor center (with bathrooms) does not stay open during the winter. There is an emergency phone at Crisp Point year-round, but getting a cell phone signal can prove difficult. If you're not in the mood for getting stuck without phone service or maybe not even seeing anyone except for the occasional snowmobiler, summer and early fall will be the best time to visit the lighthouse! Crisp Point was originally one of five U.S. Life-saving stations along the coast of Lake Superior between Munising and Whitefish Point operating during the last 25 years of the 1800s. Boatman Christopher Crisp became keeper of the life-saving station (then called Life-Saving Station #10) in 1878. Station #10 became Crisp Point in 1883, and Crisp remained in command there until 1890. Increased maritime traffic in the area led calls for a lighthouse at Crisp Point by 1896. Congress allocated $18,000 for the lighthouse construction in 1902 spent $30 for the 15-acre site for the light tower in 1903. By 1904, a fog signal building and lighthouse stood on the site. The lighthouse had a 58-foot-high tower equipped with a red fourth-order Fresnel lens from nearby Devil's Island that beamed out 15 miles over the lake. 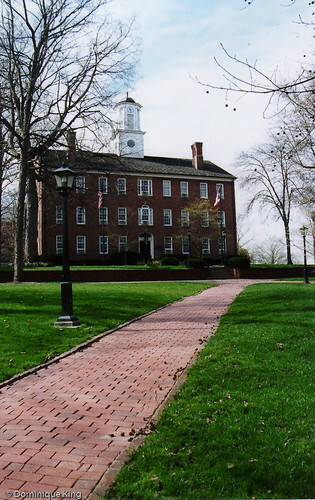 The campus soon included the life-saving station and living quarters, a brick keepers' and assistant keepers' dwelling with a basement, the brick fog signal building, an oil house set away from the home, two frame barns, a boathouse, landing and a tramway to help launch surf boats. The lighthouse was electrified and automated in 1941 to save money. 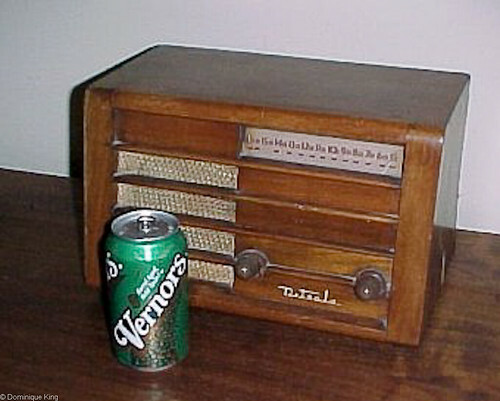 By 1947, improved radio and radio technology allowed the Coast Guard to deactivate the station, and they turned the site over to the U.S. Department of Interior in 1960. Deterioration and vandalism caused the buildings led the Coast Guard to demolish all of the structures except for the light tower and an attached service room in 1965. Deterioration caused by the elements took a toll on the site by the 1990s when Lake Superior began to lap at the base of the tower, causing some fear that the tower might collapse. 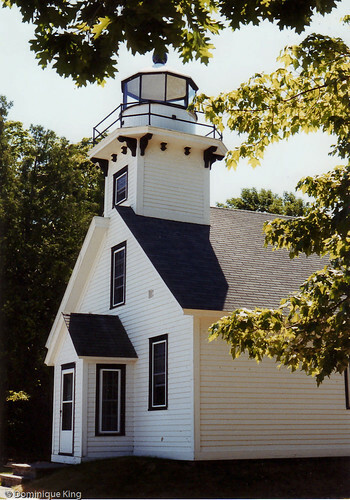 Concerned preservationists and history buffs formed the Crisp Point Light House Society (CPLHS) in 1991 as the Coast Guard moved to decommission the light tower and turn the property over to Luce County by 1993. The society began leasing the site and raising money for projects like the $42,000 they spent on erosion abatement in 1998. The group also cleaned, stabilized, painted the tower and built walkways to help stop further erosion at the site. In 2009, the CPLHS began construction on a new visitors' center at Crisp Point to house displays and a gift shop to help raise money for continued repairs and maintenance. Crisp Point supporters received a permit as a private aide to navigation in 2012.In 2013, a 300mm plastic LED marine lens in the tower, using battery and solar power, began shining each year from May 1 through November 1. Today, close to 25,000 visitors see Crisp Point Light each year. Volunteers serve as light keepers from June through October while visitors enjoy activities like photography, hunting for agates, watching freighters or climbing the 62 steps to enjoy the view from the top of Crisp Point's tower. And what became of Christopher Crisp, the original life-saving station keeper at the site? Check out this story about folks from California who sought out his nearly forgotten grave site in 2011 near Los Angeles and seeing the grave stone literally uncovered. Having a good map with you might be a good idea when you visit Crisp Point! Check out the Michigan Lighthouse Fold Map (published in 2016) or the latest edition of Delorme's Michigan Atlas & Gazetteer. Crisp Point in Michigan's Upper Peninsula on the coast of Lake Superior between Munising and Whitefish Point is one of the state's most remote and difficult-to-reach light stations, so I made a point of capturing as many photos as I could of it when we finally made it up there on a beautiful sunny day. This is yet another image from my collection of images taken last summer at Crisp Point. The lighthouse and visitor center opens from June through October with the hours depending on the availability of volunteer staff. The lighthouse normally closes the rest of the year because the long dirt Luce County Road leading to it is seasonal and remains unplowed during the rest of the year. This particular image received one of several Third Place prizes for Digital Camera Images in the Assignment category for the September 2016 competition at the Motor City Camera Club. Check out another winner from my Crisp Point collection that placed first at the Motor City Camera Club in November 2015. It also received an Honorable Mention in competition among the 10-member Greater Detroit Camera Club Council that same month. Look for a story about Crisp Point and more images from my collection this fall! Want to learn a bit more about Michigan's lighthouses? Check out A Traveler's Guide to 116 Michigan Lighthouses by Laurie Penrose, Bill T. Penrose and Ruth Penrose. Check out the Motor City Camera Club's Web site, or connect with the Motor City Camera Club on Facebook. 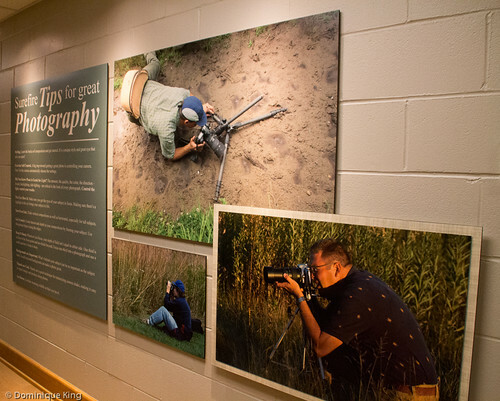 Top 10 Things to do with Families in Iowa-Check out Jody's list of fun things to do in Iowa with your kids at Trekaroo. So pretty much everyone enjoys ice cream, and the "ice cream capital of the world" makes this list as well as plenty of other fun eats, arts and history sites that everyone will love! Geauga County Amish Tours-We've driven through Geauga County multiple times, but it was nice to stop a while with Mike via this post on his OHventures blog to enjoy a few of the simple pleasures of Amish country and hop over the county line for a visit to the general store at Mesopotamia (I love the clove-flavored hard candy I've gotten here over the years!). Quirky Attraction: RV Hall of Fame-Dreaming of taking an extended road trip via a tricked out RV? Visit the RV Hall of Fame in Elkhart, Indiana to see some roomy rigs and to learn more about this lifestyle and way of traveling. Check out Scott's story at the Quirky Travel Guy blog. Positively Futuristic-You may know that I'm positively a sucker for a good story about a car museum or collection of another other sort of vintage vehicles. 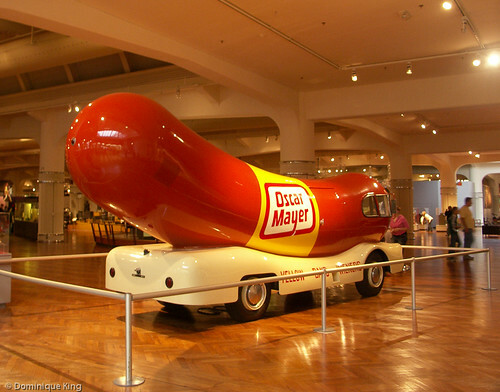 Check out Maureen's story about this collection of classic cars in Chicago, Illinois. The Klairmont Kollection includes over 300 cars with some of them sporting some really cool colors! Check it out at the Positively Tuesday blog. 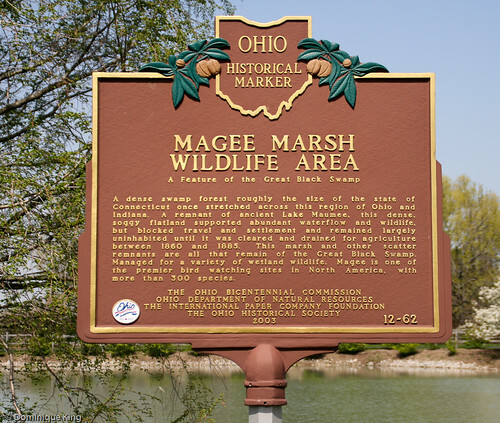 Smith Cemetery State Nature Preserve-Come along with Bob as he explores a remnant of Ohio's Darby Plains prairie that is also a 19th-century pioneer cemetery. This one-acre preserve in Madison County is a particularly nice place to see prairie wildflowers in bloom as well as learning a little about the history of the area. Check it out at the TrekOhio.com blog. U.S. Grant Home in Galena, IL-Mel is a bit of a history buff and enjoyed her visit to President Ulysses S. Grant's home in Galena, Illinois. The Grants settled in Galena at the onset of the Civil War in 1860. Grant returned to the town after commanding the Union Army and accepting Lee's surrender at the Appomattox Courthouse in Virginia in 1865. The grateful folks in Galena gave Grant this home and many of the furnishings that still remain here now. Read the story at A Little Time and a Keyboard blog. Chicago History with the Late Gene Wilder-I remember reading the Erik Larson true-crime tale that took place in early Chicago during the 1890s (The Devil in the While City), but here's a version of the tale that I did not know existed. The folks at the Chicago Architecture blog tell us that the Gene Wilder narrated a documentary film about Chicago's "White City" during 2005. Be aware that I also found it on YouTube and Amazon Prime, as well as on DVD you can purchase at Amazon. I also remember hearing that director Martin Scorsese and actor Leonardo DiCaprio plan to bring the tale to theaters as a movie, but I've yet to hear that it is anything but "in development". Check it out at the Chicago Architectural blog. Déjà Vu Tuesday: The Carole Lombard Mystery-True-life mysteries and movie stars of the Golden Age are always interesting subjects for me, and here's a classic cold-case mystery concerning Jane Alice Peters...the Hoosier actress better known as movie star, and wife of Clark Gable, Carole Lombard! Lombard died nearly 75 years ago in a plane crash in Nevada while she was raising money for a War Bond tour. Lombard was born in Fort Wayne, Indiana and a story at the Historic Indianapolis blog reports that she may have slipped away from the War Bond tour for a quick trip home to Indiana and a meeting with a well-known palm reader who allegedly foretold her then-imminent death. Check out Libby's story (and the original query from an author to her that sparked this blog post) at the Historic Indianapolis blog. How to Take Better Vacation Pictures-Sherry shares some of the best images from her travels, along with a few simple tips about composition that you should keep in mind as you point your camera and look to create some of your own memorable travel images. According to Sherry, all the fancy camera equipment in the world won't help your photos if you fail to keep a few fundamentals about composition in mind as you compose your shots. Simple ideas like The Rule of Thirds, looking for leading lines in your scene and perspective can greatly improve your photos. 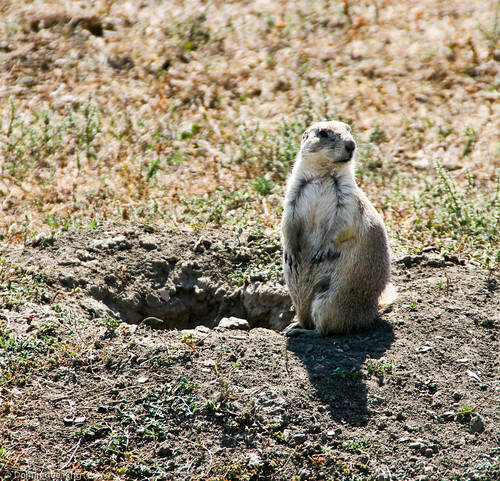 Read all about this, and see some great travel images, at Ott's World. August is a popular time for travel among many folks as many have and try to get some last trips in returning to school or work. I find myself with an out-sized list of travel stories to share this month, so check back here next week as I post a second list of Midwest travel story links for August! I've always loved visiting Great Lakes lighthouses with an eye towards capturing some nice images of them. Crisp Point is a particularly remote and isolated light house in Michigan's Upper Peninsula on Lake Superior's coast between Munising and Whitefish Point, and it was long on our list of lighthouses we wanted to visit. We finally were able to allot most of a day to make the long drive on up to the lighthouse when we stayed at Les Cheneaux Islands on the eastern end of the UP this past summer. The road seemed to go on forever through the Lake Superior State Forest, and we saw nearly no traffic along the dirt road. Surprisingly, we saw plenty of vehicles in the parking lot at the light as we rounded the last corner along the route and saw an expansive view of Crisp Point and a lighthouse with a full crew of volunteer light keepers ready to tell us about the beautiful spot. Telling the story of Crisp Point is still on the agenda for Midwest Guest, but we're sharing this winning image of the light in the meanwhile. The lighthouse and visitor center opens from June through October, with hours depending on the availability of volunteer staff. Luce County Road, the long dirt route leading out to the light, is a seasonal road and not plowed during the winter. This particular image placed first for Digital Camera Images, Color General, Beginner Division in November 2015 at the Motor City Camera Club and also earned an Honorable Mention in competition among the 10-member Greater Detroit Camera Club Council in November 2015. Here's another image from our trip to Paris nearly a decade ago. 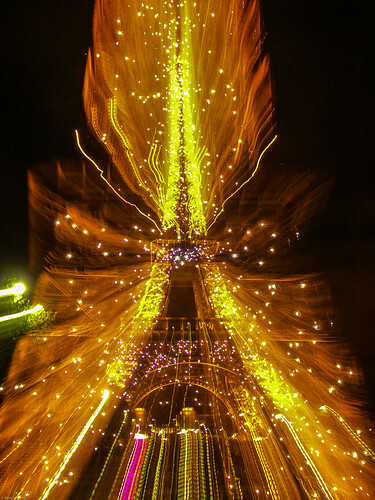 We stayed at a bed & breakfast inn within walking distance of the Eiffel Tower and enjoyed spending several of our evenings walking to the Parisian landmark and trying to capture images of the lighted tower at night. This was my attempt at being a little creative by zooming my lens as I tried capturing the image, and it ended placing first for Digital Images, Color Creative, Beginner Division in October 2015 at the Motor City Camera Club. The Eiffel Tower, its construction and its place is Parisian history always fascinates me, and I've read several books about the subject. Here are a couple worth checking out: Eiffel's Tower: The Thrilling Story Behind Paris's Beloved Monument and the Extraordinary World's Fair That Introduced It by Jill Jonnes and Murder on the Eiffel Tower: A Victor Legris Mystery by Claude Izner (which is first in a series of mysteries, and Izner is the pen name for a pair of Parisian book-selling sisters). We visited Paris a dozen years ago, and I recently went through some of my images from that trip and entered a couple of them into a monthly Motor City Camera Club competition. This particular image of Napoleon's statue at one of the buildings in Les Invalides placed third for Digital Images, Color General, Beginner Division competition for October of 2015 at the Motor City Camera Club. For a more up-to-date travel guide for Paris than what I have on my bookshelves right now, check out Top 10 Paris by DK Publishing, Streetwise Paris Map-Laminated City Center Street Map of Paris, France by Streetwise Maps or Lonely Planet Pocket Paris by Lonely Planet and Catherine Le Nevez. Better yet, want to write your own book about the city and its sights? Check out this Cool Image blank journal featuring an image of Les Invalides on its cover. 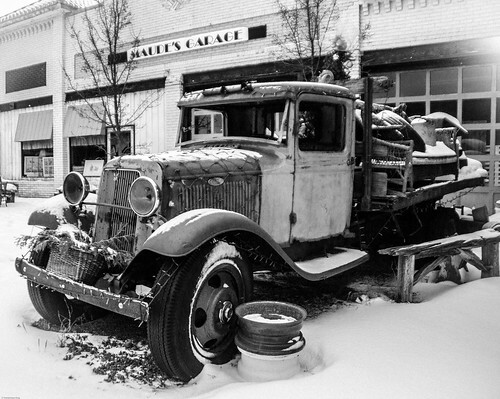 I spotted this old truck in the driveway of an antique store in downtown Ludington, Michigan when we visited the western Michigan town on my birthday in late January. I quickly made a few versions of the image as I battled the wind and cold, which made it difficult to capture a sharp image of the old battered truck. I opted to share this one here as a black-and-white version that seems to more readily capture the mood of the gloomy day. Want to learn more about Ludington and its lumbering hey day? Check out Ludington: 1830-1930 (Images of America) by James L. Cabot. We love the yearly Concert of Colors world music and unity festival that takes place each summer in Detroit. We've written about it many times, and I've published many images from the festival over the years here at Midwest Guest. Thornetta Davis is one of our favorite performers, and this image happens to be a favorite of mine! 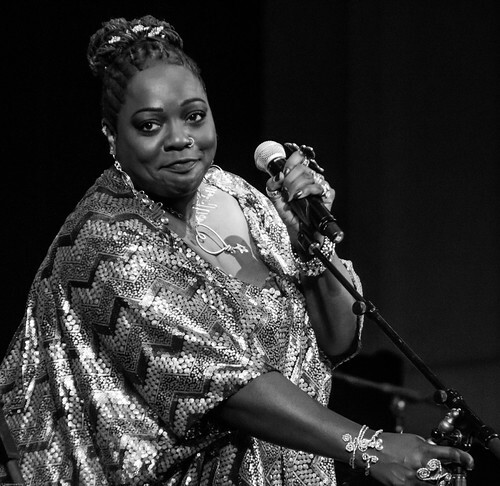 We particularly love her as a blues singer, but we've seen her perform gospel, rock and other genres in various venues around town. Go see her if you're in town and notice that she's playing a gig near you! Can't get to see her in person? Check out Amazon for Sunday Morning Music, with lots of self-penned music, or Thornetta Davis Covered Live at the Music Menu, which includes some of my favorite classic blues tunes like I'd Rather Drink Muddy Water and Meet Me With Your Black Drawers On! This particular image placed second in Monochrome General, Beginner Division competition for September 2015 at the Motor City Camera Club. The Greater Detroit Camera Club Council, consisting of 10 member clubs around the metro area also recognized this image with a third-place prize for Monochrome General in November of 2015.